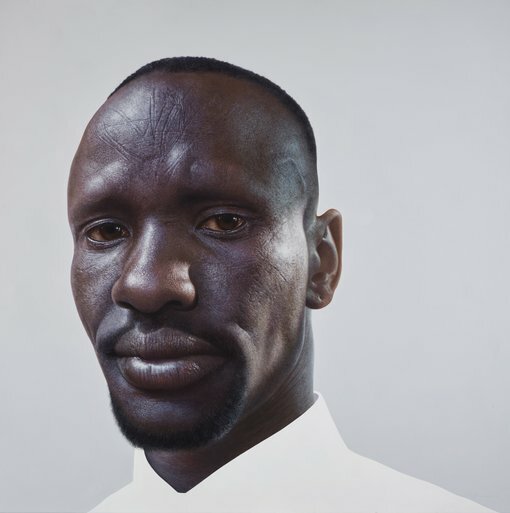 Sydney artist and Archibald Prize veteran Nick Stathopoulos is the winner of the 2016 Archibald Prize People’s Choice award with his hyper-real portrait of Sudanese refugee and lawyer, Deng Adut. Stathopoulos’s portrait of Adut is his fifth finalist entry in the esteemed Archibald Prize. It is the first time Stathopoulos has won the People’s Choice Award. The portrait of Adut is a clear winner this year, unlike the 2015 People’s Choice winner when three works vied week after week for the prize before being awarded to artist Bruno Jean Grasswill with his subject, Australian actor Michael Caton. Stathopoulos said the portrait took more than four months to complete – more time than he has ever spent on any single painting. “I’m actually a very traditional practitioner by choice. I’ve spent my entire life developing my style and process. What I do is time-consuming, laborious and painstaking. “I don’t think we give the general public enough credit when it comes to matters of art. In my experience they are very clued-in. And when it comes to the Archibald Prize People’s Choice Award, they seem to get it right every year. “The critics may balk, but the public always manages to pick my favourite paintings. So I’m delighted they chose my portrait of Deng Adut. It’s a great affirmation,” said Stathopoulos. Adut first came to the attention of Stathopoulos through a video promotion for Western Sydney University, where Adut was a graduate. It documented Deng’s childhood and experience as a child soldier in Sudan and his journey fleeing the country before he put himself through law school and became a formidable refugee advocate and community leader. Adut said he’s humbled that the Australian public chose the work to win the People’s Choice Award for 2016. “It must be some sort of magic, but Nick really captured what’s underneath my skin in his painting. “It can be hard for me to look at – not least because my nose looks so big!” Adut said. Since the 2016 Archibald Prize opened in July, visitors to the exhibition have voted on their favourite work, with Nick Stathopoulos’s painting receiving the most votes. The People’s Choice award carries a $3,500 cash prize for the artist. Each year one person who voted for the People’s Choice award-winning painting is selected at random to win a People’s Choice voters’ prize. In 2016, the lucky voter is Jenny Howlett, who receives a $3,500 cash prize. “Yearly my family and I attend the Archibald Prize exhibition, it is a captivating event. Winning the People’s Choice voter’s prize means my vote brought further recognition to the heart wrenching portrait of Deng Adut,” Howlett said. Tickets can be used once, anytime the exhibition is open. You don’t specify a date or time when booking.